If superdiva Aretha Franklin is still hungry after finishing off her simple backstage spread of canapés and ginger ale, the Queen of Soul will have no problem springing for a little post-show grub. That's because Franklin requires promoters to provide her with $25,000 in cold hard cash on the night of a concert (which represents only a portion of her appearance fee). We're not sure where she stashes all that green, but her, um, flowing gowns probably have a few spare pockets. Submitted by Betty Culbreath on Fri, 2010-11-19 02:07. 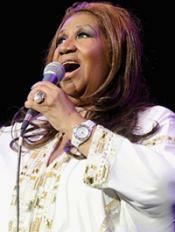 I love Ms. Franklin but for her health sake,she needs to lose weight.